Tylosaurus was a mosasaur, a large, predatory marine lizard closely related to modern monitor lizards and to snakes. Along with plesiosaurs, sharks, fish, and other genera of mosasaurs, it was a dominant predator of the Western Interior Seaway during the Late Cretaceous. Tylosaurus proriger was among the largest of all the mosasaurs (along with Hainosaurus and Mosasaurus hoffmannii), reaching maximum lengths of 14 m (46 ft). A distinguishing characteristic of Tylosaurus is its elongated, cylindrical premaxilla (snout) from which it takes its name and which may have been used to ram and stun prey and also in intraspecific combat. Stygimoloch (meaning "demon from the Styx") is a genus of pachycephalosaurid dinosaur from the end of the Cretaceous period, roughly 66 million years ago. It is currently known from the Hell Creek Formation, Ferris Formation, and Lance Formation of the Western Interior (United States), where it lived alongside Tyrannosaurus and Triceratops. The type species, S. spinifer (meaning "thorny devil from the Styx (river of death)"), was described by British vertebrate paleontologist Peter Galton and German paleontologist Hans-Dieter Sues of the National Museum of Natural History in 1983. 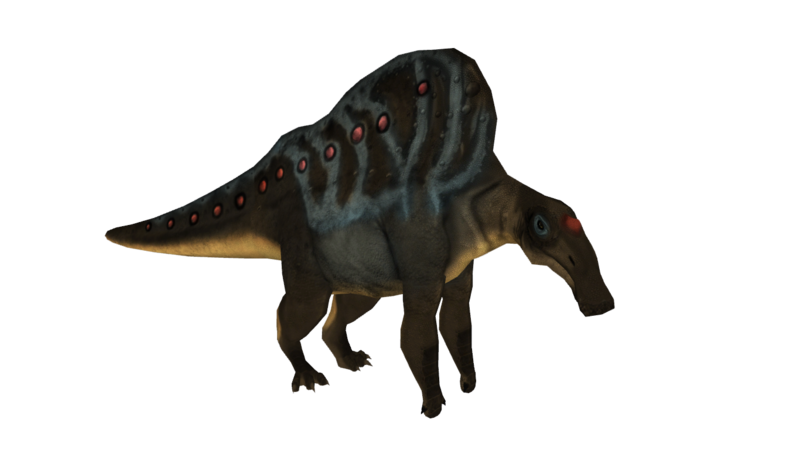 Stygimoloch is characterized by clusters of spikes on the back of the skull, in which a long central horn is surrounded by 2-3 smaller hornlets, and a tall, narrow dome. Rajasaurus (meaning "king" or "king of lizards") is a genus of carnivorous abelisaurian theropod dinosaur with an unusual head crest. Between 1982 and 1984, its fossilized bones were discovered by Suresh Srivastava of the Geological Survey of India (GSI). Excavated from the Narmada River valley in Rahioli in the Kheda district of Gujarat, India, the find was announced as a new genus of dinosaur by American and Indian scientists on August 13, 2003. RELEASED EXCLUSIVELY FOR THE ZT2 ROUND TABLE. Tyrannosaurus rex is one of the most well-known of all dinosaurs. It is no longer considered the largest of the theropods. Tyrannosaurus was the last and largest of the Tyrannosaur family, or tyrant dinosaurs. As far as size goes, of the five Tyrannosaurs to prominently appear in the Jurassic Park series, the adult female seen in the first film was 43 feet long and between 16 and 17 feet tall, making her one of largest predators to appear in the Jurassic Park trilogy. Inostrancevia is an extinct genus of carnivorous therapsids, containing the largest members of the family Gorgonopsidae, predators characterized by long, saber-tooth-like canines. The various species inhabited Northern Russia during the Upper Tatarian (Vyatskian), a Russian regional stage equivalent to the Wuchiapingian stage of the Late Permian period, dating from approximately 260 to 254 mya. It is known from several skulls and two almost complete skeletons. 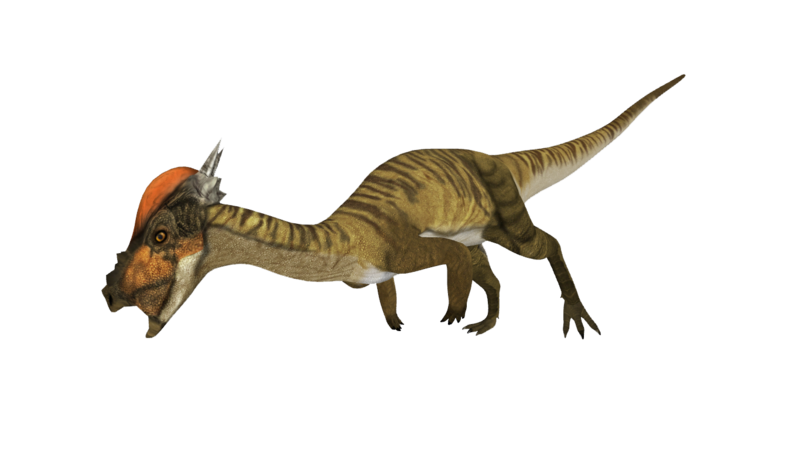 Altirhinus ("high snout") is a genus of iguanodontian ornithopod dinosaur from the Early Cretaceous Period of Mongolia. The characteristic arched snout of Altirhinus was formed primarily by the nasal bones, and a similar structure is seen on the snout of the Australian Muttaburrasaurus. Many different functions have been proposed for the nasal arch. As only two skulls have been located, it is entirely possible that the arched snout is only found in one gender, in which case it may have been used for sexual display, like in modern-day elephant seals. Wuerhosaurus is a genus of stegosaurid dinosaur from the Early Cretaceous Period of China. As such, it was one of the last genera of stegosaurians known to have existed, since most others lived in the late Jurassic. Shunosaurus, meaning "Shu Lizard", is a genus of sauropod dinosaur from Middle Jurassic (Bathonian–Callovian) beds in Sichuan Province in China, 170 million years ago. The name derives from "Shu", an ancient name for the Sichuan province. the tail ended in a club, equipped on its top with two successive spikes formed by 5 centimetres-long cone-shaped osteoderms probably used to fend off enemies. Tsintaosaurus (meaning "Qingdao lizard", after the old transliteration "Tsingtao") is a genus of hadrosaurid dinosaur from China. It was about 10 metres (33 ft) long, 3.6 metres (12 ft) tall and weighed 3 tons. Originally known as the "unicorn dinosaur" due to its crest, until late 2013 when more fossil of it was discovered, providing a better view of the hadrosaur. Vulpimancer, aka wildmutt is a fictional alien from the kid's show Ben10, which i am a fan of when i was a kid. Vulpimancers are far more animalistic than humanoid. They can range from the size of an adult human to several times the size of a human. As they mature, they grow tails. Vulpimancers from Vulpin are orange. Vulpimancers from the Null Void can be orange, grayish blue, red or brownish red. Carnotaurus is a genus of large theropod dinosaur that lived in South America during the Late Cretaceous period, between about 72 and 69.9 million years ago. Carnotaurus was a lightly built, bipedal predator, measuring 8 to 9 m (26 to 30 ft) in length and weighing at least 1.35 metric tons (1.33 long tons; 1.49 short tons). 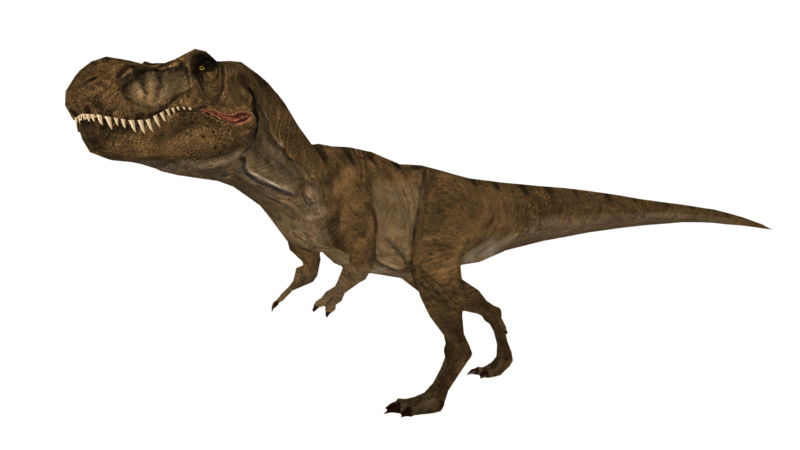 As a theropod, Carnotaurus was highly specialized and distinctive. It had thick horns above the eyes, a feature unseen in all other carnivorous dinosaurs, and a very deep skull sitting on a muscular neck. 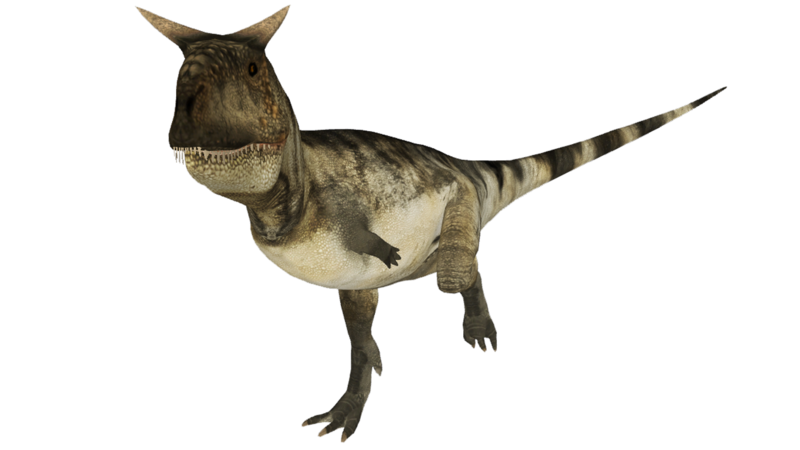 Carnotaurus was further characterized by small, vestigial forelimbs and long and slender hindlimbs. The skeleton is preserved with extensive skin impressions, showing a mosaic of small, non-overlapping scales measuring approximately 5 mm in diameter. The mosaic was interrupted by large bumps that lined the sides of the animal, and there are no hints of feathers. Ouranosaurus (meaning "brave (monitor) lizard") is an unusual genus of herbivorous iguanodont dinosaur that lived during the early Cretaceous (late Aptian age) at some point between 125 and 112 million years ago, in what is now Africa. Ouranosaurus measured about seven to eight metres long (23 to 27 ft). Two rather complete fossils were found in the Echkar (or El Rhaz) Formation, Gadoufaoua deposits, Agadez, Niger, in 1965 and 1972.The animal was named in 1976 by French paleontologist Philippe Taquet; the type species being Ouranosaurus nigeriensis. Tyrannosaurus ("tyrant lizard", from the Ancient Greek tyrannos ( "tyrant", and sauros , "lizard") is a genus of coelurosaurian theropod dinosaur. The species Tyrannosaurus rex (rex meaning "king" in Latin), commonly abbreviated to T.rex, is one of the most well-represented of the large theropods. While there is no direct evidence for Tyrannosaurus rex having had feathers, many scientists now consider it likely that T. rex had feathers on at least parts of its body,due to their presence in related species of similar size. Dr. Mark Norell of the American Museum of Natural History summarized the balance of evidence by stating that: “we have as much evidence that T. rex was feathered, at least during some stage of its life, as we do that australopithecines like Lucy had hair. 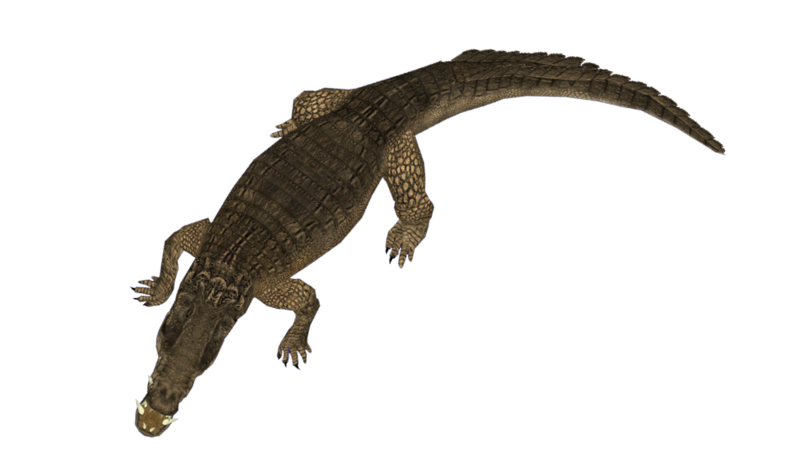 Kaprosuchus is an extinct genus of mahajangasuchid crocodyliform. It is known from a single nearly complete skull collected from the Upper Cretaceous Echkar Formation of Niger. The name means "boar crocodile" from the Greek kapros ("boar") and souchos ("crocodile") in reference to its unusually large caniniform teeth which resemble those of a boar. It possesses three sets of tusk-like caniniform teeth that project above and below the skull, one of which in the lower jaw fits into notches in upper jaw. Another unique characteristic of Kaprosuchus is the presence of large, rugose horns formed from the squamosal and parietal bones that project posteriorly from the skull. 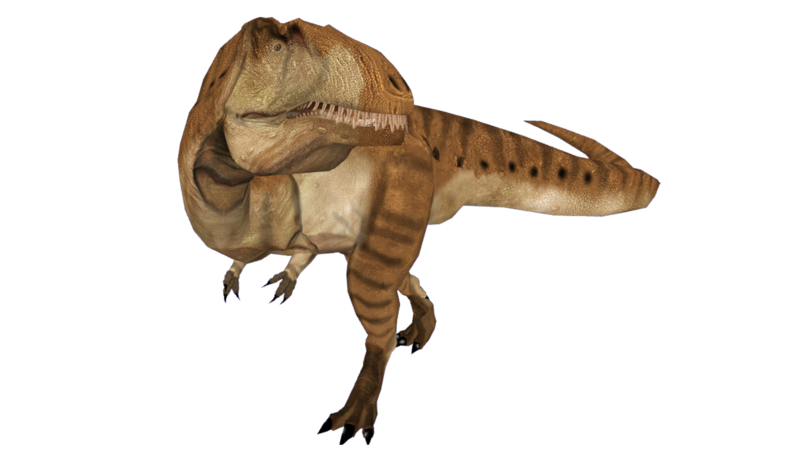 Acrocanthosaurus is a genus of theropod dinosaur that existed in what is now North America during the Aptian and early Albian stages of the Early Cretaceous. 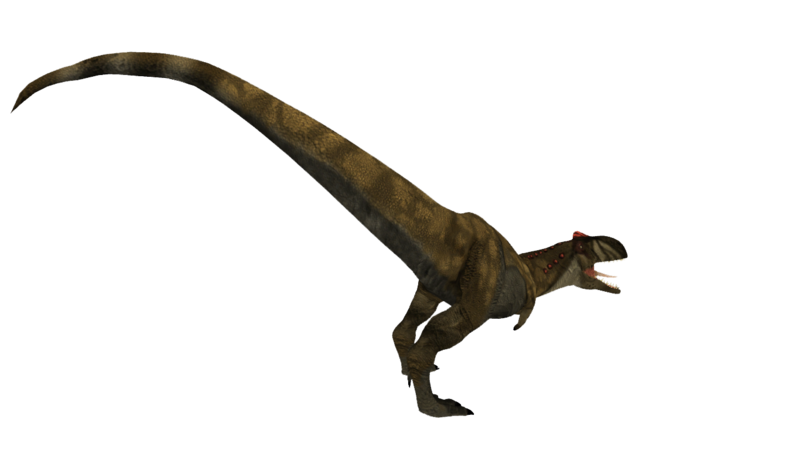 Like most dinosaur genera, Acrocanthosaurus contains only a single species, A. atokensis. Although slightly smaller than gigantic relatives like Giganotosaurus, Acrocanthosaurus was still among the largest theropods ever to exist. 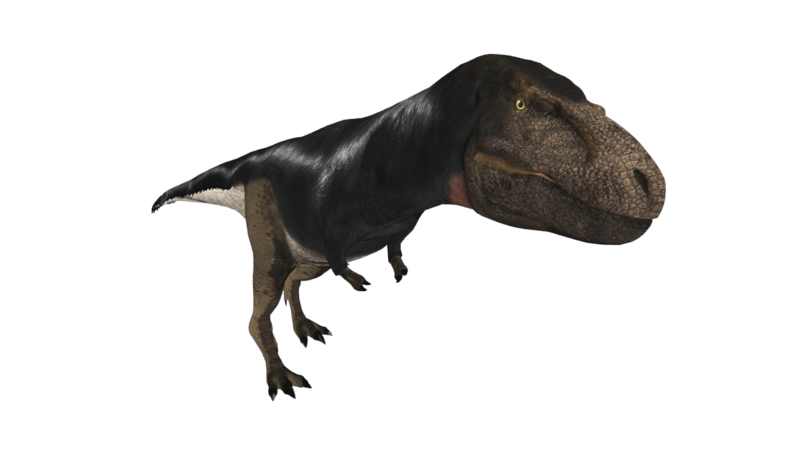 Tarbosaurus (meaning "alarming lizard") is a genus of tyrannosaurid theropod dinosaur that flourished in Asia about 70 million years ago, at the end of the Late Cretaceous Period. Fossils have been recovered in Mongolia, with more fragmentary remains found further afield in parts of China. Ichthyovenator is a spinosaurid theropod dinosaur from the Early Cretaceous of Laos. 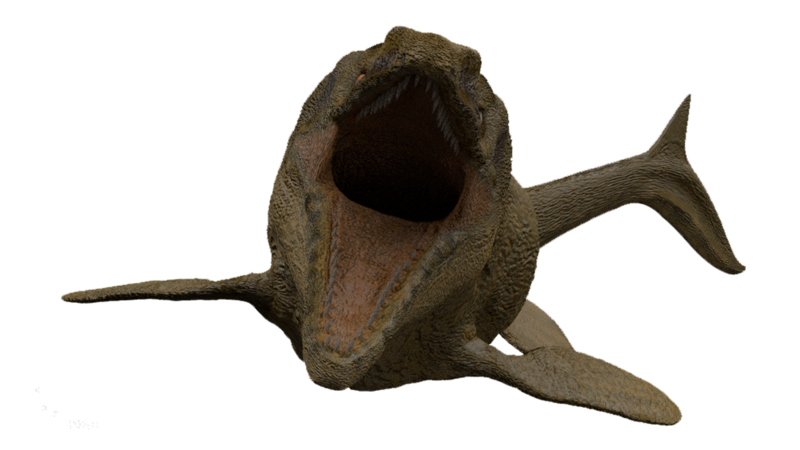 Unlike other spinosaurids, Ichthyovenator has at least two separate sails (or hump) for reason unknow. Nasutoceratops is an extinct genus of ceratopsian dinosaur. It is a basal centrosaurine which lived during the late Cretaceous period (late Campanian, about 76.0-75.5 Ma) in what is now southern Utah, USA. Nasutoceratops was a large, ground-dwelling, quadrupedal herbivore with a short-snout and unique rounded horns above its eyes that have been likened to those of modern cattle. Extending almost to the tip of its snout, these horns are the longest of all the members of the centrosaurine subfamily. Crichtonsaurus is a genus of ankylosaurid ankylosaur dinosaur named for Michael Crichton, the author of Jurassic Park. It was an ankylosaurine, and it lived during the late Cretaceous Period. It was named to honor Michael Crichton, the author of the Jurassic Park novel.